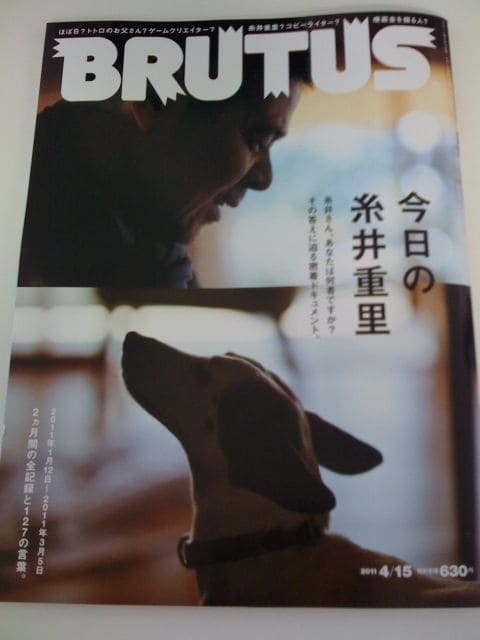 I’ve gone through that discussion between Itoi and Iwata that was in the BRUTUS magazine the other day. Here’s a rough translation of it, as usual it’s sometimes kind of hard to pin Itoi’s thoughts down into something that makes sense, but it should get his basic ideas across. THE FEELING OF, “I WANT MOTHER 4 TO BE RELEASED!” IS INSIDE ME, TOO. To make a long story short, when development on Shigesato Itoi’s “MOTHER 2” ran into severe setbacks, it was Satoru Iwata of HAL Labs who showed up to save the day. The two became close friends, and Mr. Iwata eventually went on to become the president of Nintendo. I, Yasuhiro Nagata, a huge fan of the MOTHER series and a member of Hobonichi (translation note: Hobonichi is Shigesato Itoi’s company website) was in charge of this discussion. ITOI: Mr. Nagata said that since I was going to meet with you anyway, perhaps we could discuss MOTHER 4 a bit as well. IWATA: So you suggested this as a fan? ITOI: Honestly, now! Snatching away TWO busy CEOs and forcing them to talk about what YOU want…! ITOI: This displeases me! I’m leaving! NAGATA: But you just got here. ITOI: Anyway, in all seriousness, when he gave me that reply, I thought, “You know what? He’s right.” Actually, lately I’ve started to feel very glad that I released the MOTHER games. ITOI: I’m not going to release a MOTHER 4; MOTHER is over now. But lately I’ve started to really appreciate having released three MOTHER games. That’s why I thought I’d come see you, Mr. Iwata, so I could talk about those feelings with you. IWATA: Sounds good to me. Could you go into more detail about these feelings of yours and how they’ve changed? ITOI: Yeah. I feel appreciative of them, but recently I’ve begun to feel more than that; I’ve started to realize I feel very fond of them too. IWATA: Ah, that IS interesting. “Appreciative” and “fond of” are similar, but there IS a difference. ITOI: There is. I’m sure it’s the same with any product or work of creativity – in the very end, it’s the customer or end user who finishes it for you. Even with toothpaste, for example, the product only reaches its conclusion when a customer chooses to use your particular toothpaste to brush his or her teeth. In that same way, people playing through a game you’ve made makes you feel very appreciative of them. IWATA: I agree. Playing through a game actually takes a lot of work, so you feel really grateful to people who’ve gone through all the trouble and all the work to play through one you’ve made. IWATA: For someone to come and finish. IWATA: Even after so much time has passed, too. When you think about it, it’s probably normal to forget most everything you experienced at the time. Yet, people still look back and discuss these particular games. That makes you feel more than just appreciation for them – you start to feel a real fondness for them too. ITOI: Yes. Also, imagining if the MOTHER games had been someone else’s creation instead of mine, I think I would’ve really liked them. ITOI: I think I would’ve loved it as a player, and would’ve wanted to meet other people who liked it too. IWATA: Ah, I see. When you brought your idea for a game called MOTHER to Nintendo, was it that you wanted to try your hand at creating it, or was it that you wanted it to be created so you could play it? ITOI: I just wanted to play it, of course. IWATA: That’s a very Shigesato Itoi-like starting point for sure! (laughs) If I had asked Mr. Miyamoto (Shigeru Miyamoto, the creator of Mario) the same thing, for example, he would never have answered, “I just wanted to play the final version.” I’m almost certain of it. ITOI: Yeah, you’re probably right. He and I DO come from different professions. 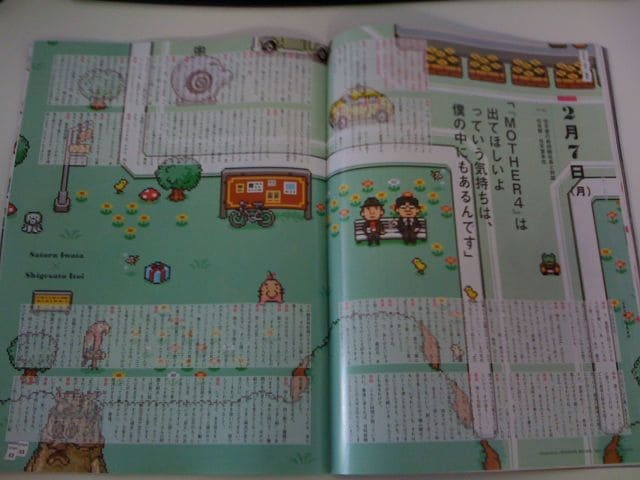 ITOI: Some people consider MOTHER entries to be big scenario scripts rather than games. But that’s not quite right; they wouldn’t have been interesting at all if they hadn’t been in game form. That’s what they were made to be from the very start, after all. They wouldn’t have been much fun in text form only. In game form, they’re an amalgamation of the ridiculous ideas I sometimes have as a player. For example, in the Lost Underworld area of MOTHER 2, I portray the large size of the world by making the main characters very tiny. I would give these kinds of ideas to people at the workplace, and after a while of this, other people would start chiming in with other similar ideas of their own. Those links of reckless wildness are what the MOTHER games are built on. IWATA: I agree. E-mailing game scripts from home wouldn’t have produced those kinds of results. ITOI: Definitely not. It was because we were always saying, “Boy, this part is bland…” at the workplace that things like the underwater oxygen machines in MOTHER 3 came about. NAGATA: There’s a section in the game where you travel along the ocean floor. Your breath slowly runs out, so you have to use oxygen machines to replenish your air supply. And, for whatever reason, those oxygen machines are crossdressing mermen who use mouth-to-mouth to give you their air. ITOI: After trying to come up with so many ideas and rejecting them all, it’s a real treat when you hit upon such a “far out there” solution. IWATA: The more you struggle with something, the more unique and memorable it becomes. NAGATA: I’d like to ask you this, Mr. Iwata. Why do you suppose it’s generally so difficult for unique game ideas to come about in the workplace? IWATA: Well, someone who’s made games for a very long time will have naturally devised a standard set of solutions to problems that pop up during the game creation process. The more experience they’ve had, the larger their set of solutions is. So, when there’s a problem that needs to be resolved, the first thing they’ll go to is their standard response; “This problem calls for this solution.” They can see their own solution clearly, but have difficulty coming up with any others. IWATA: For example, there are “double pictures” that are optical illusions drawn in such a way that you can see two different things depending on how you look at them. This is like those; once you see one image, you lose sight of the other one. In that sense, your results will never be out of the ordinary if all you can see is the one half-hearted solution. NAGATA: So it’s not because of laziness or holding back or anything like that. IWATA: Right. Once you find an answer, that pathway inside your mind activates, meaning you lose sight of any other solutions that might be interesting or unusual. ITOI: Yes, because it’s something they’ve seen done before. NAGATA: I see. I think that’s one reason why it’s difficult for other MOTHER-like games to come about. ITOI: Yes. (laughs) The Octopus Eraser is an often-cited example. IWATA: Well, it does pretty much drive the point home. NAGATA: For those not familiar with the game, there’s a point in one of the games where an octopus blocks your path. You have to get past it to continue to the next location in the game. ITOI: The idea to block the path with an octopus was born from desperation and struggling. Normally you’d just block a path with a rock, you know? NAGATA: How DO you get rid of that octopus? ITOI: Why, with an Octopus Eraser, of course! ITOI: The Octopus Eraser would actually erase all the octopuses in the world. So after using it to erase the octopus blocking the path, I could also imagine the octopus inside takoyaki everywhere (translation note: fried octopus dumplings) suddenly vanishing, and people being like, “Hey, there’s no octopus in this!” That wasn’t something I put in the game, but thinking about that sort of stuff is a hobby of mine. IWATA: I understand that feeling very well. ITOI: Being weird or goofy isn’t my only aim, though. It might not be something game creators these days go for, but more than anything I have this strong desire to make people feel distraught. I want to give them laughter and joy too, of course, but I’m always filled with the desire to make people feel ever-so slightly heartbroken. Not just in games, but all sorts of things I work on. IWATA: You aim for that, rather than try to deeply move them or make them cry? IWATA: I can’t really think of any other things that are made with that mindset. ITOI: It’s almost kind of like my personal “theme”. I would say every line of dialog in the MOTHER games out loud when I came up with them. Someone would type them in for me, and then I would go over the words visually after having said them. ITOI: Yes. So whenever that “heartrending” feeling REALLY hit them hard, they’d always turn around and be harsh with me. IWATA: It sounds like you were so immersed in the story that you had started to forget your respect for Shigesato Itoi outside of it. ITOI: After all, you could even say I only added the funny and ridiculous lines into the mix so that I could include one heartrending line with them. It’s more than just the scenarios or the things like the Octopus Eraser; I really felt there needed to be dash of “heartbreak” mixed in, even if it just happened to be in simple lines said by side characters. IWATA: It wouldn’t be MOTHER otherwise. ITOI: Right. It might not be very common in ordinary games. There’s a touch of it in Pixar movies, though. IWATA: Yes, Pixar movies definitely have that heartrending feeling to them. NAGATA: The essence of Porky (translation note: Porky was localized into Pokey in EarthBound) exists in Pixar films. IWATA: So, again, why do you think the MOTHER games have left such strong impressions on so many people? ITOI: I guess because I’m serious about my work? NAGATA: But so is everyone else. IWATA: But there ARE lots of people out there pour their all into creating games. Not everyone does, but there are plenty of other people who are serious about their own games. So what is it about your games that give them this special profoundness, this special staying power? I think one major factor is that they’re unusual games that portray that “wistfulness” you mentioned earlier, but I feel like that isn’t enough to explain it. In fact, we could probably talk forever, analyzing what gives the MOTHER games their charm. ITOI: Ah. What’s quietly flowing beneath the surface is a child. My daughter never did play through the games in the end, but they were a clear letter to her. They were a letter to my own daughter who I couldn’t see for a while due to divorce issues. NAGATA: Because he’s always watching the main character on his adventure from afar. IWATA: Also, there’s the “Two-hour Dad”. ITOI: Yes, yes, there was that too. NAGATA: But then you added a similar feature to the Wii later on. IWATA: That’s right. (laughs) Mr. Itoi’s idea of adding a “Two-hour Dad” had at some point taken hold of me, and I wound up adding something similar to the Wii. NAGATA: Yeah, there’s a log of what games you’ve played and how long you’ve played them. And you can’t delete it. It’s like a parent keeping watch from afar. 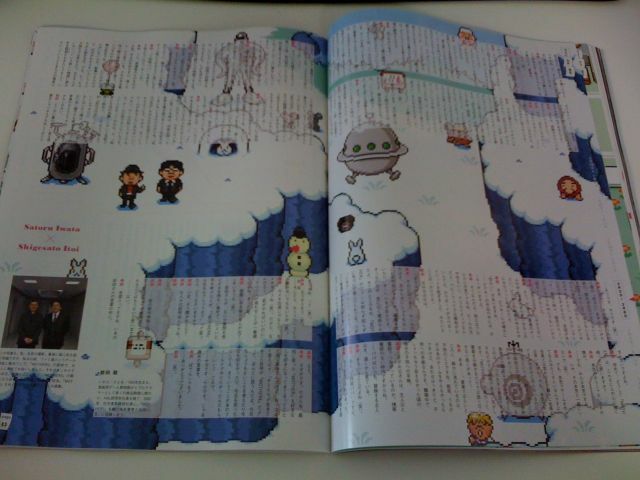 ITOI: Just goes to show that you’ve played a lot of MOTHER too, Mr. Iwata. NAGATA: I’ve always felt that the title of “MOTHER” suggests a parent watching over their children. ITOI: Yes, like a caregiver. Someone who doesn’t say or do anything to interfere – just watches from afar. In one sense, I think that might be the ideal image of a parent. I absolutely love the Pippi Longstocking stories. In them, her father is gone. He’s a sailor who’s gone missing. Despite that, Pippi is really strong and full of life. Her father’s absence isn’t used as a way to give the reader sadness to indulge in; instead, it’s simply given as a fact of life as the story continues forward. I think that might be the same thing here. That’s why, looking back at the MOTHER series, I feel like I had a reason for making MOTHER 1 through 3. But now my kid is all grown up. NAGATA: Meaning a MOTHER 4 is…? ITOI: The feeling of, “I want a MOTHER 4 to be released!” is inside me, too. Even if it’s not something I need to do, I still feel that way. Still, there isn’t someone for me to watch over from afar anymore. If there were a fourth game, I’d want to be the player. NAGATA: In other words, you wouldn’t mind if someone other than yourself made it? NAGATA: Mr. Iwata. If you were in a position where you HAD to give an answer and someone asked you if a MOTHER 4 would ever be released, what would you say? IWATA: If someone asked me that right now? ITOI: Like if you were at a presentation meeting or something. IWATA: …… I don’t believe there will be any new MOTHER games made using the same production system as before. ITOI: Mr. Iwata’s words just now say it all. ITOI: Well put. Like I said before, I’ve started to grow fond of people who like the MOTHER games, but to put that in a cooler way, I might say, “The very lives you’re living now are MOTHER 4.” I really feel that way. “Today we had lots of ridiculous thoughts, today we felt sadness, today we laughed a lot.” That’s what I had set out to do within the world of those games. How’s that? Is that enough for your article? NAGATA: Yes, it’s more than enough. Could you give some closing words? Born in 1959. Helped develop many games as a programmer from the dawn of the home console era. Became the president of HAL Labs, and eventually became the CEO of Nintendo in 2002. Met Shigesato Itoi during the development of MOTHER 2. The two are now close friends. Mr. Nagata says: I took this photo myself as well. Just as a quick personal side, I used to work for a game magazine called Famitsu. I met these two while doing research about MOTHER 3. That eventually led me to work for Mr. Itoi’s company, Hobonichi. I was fortunate to participate in MOTHER 3’s development, as well as organize this insightful discussion. I’m very grateful for this almost magical connection that I’ve had with the MOTHER series. This is as powerful as the games themselves. It’s funny that Itoi should mention Pixar in this interview, when I was thinking since I saw WALL-E that Pixar would be an awesome production studio from which to spearhead film adaptations of the MOTHER series. It’s hard to read stuff like this. 🙁 Maybe it’s for my own good, but I desperately wish Itoi would continue his work on MOTHER. Yes, three games was a lot, and I certainly am thankful for them, but… I just can’t help but feel like I really want more MOTHER. Who knows, though. Maybe MOTHER will continue, only in a different form. Iwata did not outright say, “No, there will never be another MOTHER game.” While I think Itoi is what really makes the games, I’d be open to seeing someone else produce a MOTHER title to see what happens. I honestly feel like that was an open invitation to all game developers of the future. It was not an invitation for somebody else to make another Mother game for him, it was an invitation to make a game with the Spirit of creativity and heartrending dialogue and actions. And his closing words: “POTENTIAL!” were… deceptively fitting. Well, that explains Pippi in Mother1. I think I’m content with just having 3 MOTHER games, especially if I’m living the fourth line. Itoi’s wisdom transcends language (although it certainly helps to be translated by a master translator ;)). Just try not to get your head handed to you! Considering how much EarthBound shaped my life, I can see how I’m living Mother 4. Mother 3, despite how much of a masterpiece it is, came a little too late for that. So maybe I’m living Mother 2.5 ? Nevermind. That’ll teach me to comment before reading an article, regardless of how long it is. Wow, something about this makes me proud to have created this image a while back. I personally always thought MOTHER 4 was whatever our imaginations left us with or inspired in us by our involvement in the first 3 games. For instance, I saw enough fan interpretations and guesses of what MOTHER 3’s plot would be concerned before the game actually came out that they could serve as completely unique and original works having no connection to the game, and just comparing the first game to the last in the series, that’s perfectly in line with the spirit of MOTHER to begin with IMO. “Once you find an answer, that pathway inside your mind activates, meaning you lose sight of any other solutions that might be interesting or unusual. By the way ‘Mato – What was the original word in Japanese that you translated as ‘distraught’ here? I’d like to look into the nuances of it… seems like something important might be there. By the way… I didn’t edit my above post and put in too many by the ways in there. Just posting to let you know, by the way. Bye! We are living Mother 4 and also even if we wanted a Mother 4 game that is just a feeling we all get whenever we play such epic games like Earthbound. Even so,are we living what we call the perfect Mother 4 with our thoughts ? Wow. I can’t believe how fine I suddenly feel with there never being another “official” Mother 4. I really enjoyed the review, and getting to see Itoi’s perspective as one of the minds behind the series. I understand his point of view, and I can see why he wants to encourage such spirit in other original works. I almost want to take Super Train Station H’s Mother 4 mock-up and make that the dressing to my front window, or the frame for my computer desktop. Put that spirit into output, to create and grow. Just… how else can you say it? Perhaps this is why I’ve never liked fan works much. It has the inspiration and emotion of the creator behind it, but it’s muffled. Ah, now I want to go… DO SOMETHING WITH POTENTIAL! Thanks for translating, MATO! Looks like it was quite a chore. Thank you for posting this. Reading it made me so, so happy and inspired. I know she’s at least played parts of the first game, but the sound/animation of when you get into a battle scared her a lot or something, according to an interview around M1+2’s release. I’m sure if his daughter read this interview she would probably start tearing up, maybe she’d go finish one of the games then. Wow, those are some deep thoughts. As sad as I am that there likely won’t be a Mother 4, I respect Itoi-san’s decision. Rather than drag the series out with sequel after sequel like so many other franchises, he’s chosen to end it on a high note and leave the rest up to fans. That seems very tasteful…. I actually teared up when I read that we’re living Mother 4. I mean after playing through Earthbound and Mother 3 and just thinking about it, the Mother series is the closest you can get to real life in a video game. Literally the closest. I bet this article made a big difference in BRUTUS’s sales. A really great interview, thanks for the translation! Happy to hear that Itoi and Iwata are feeling the same “fondness” for the series that we all have. I’m curious as to what is meant by “distraught”… perhaps you can elaborate having translated this interview. Something like confused and heartbroken might’ve been a better translation. What is the Japanese word he used in that context? I’m just curious. I hope this is released. I’ve only recently become a fan of the MOTHER series, but that doesn’t change the fact that I think the series is amazing. Well they should still develop a mother 4 or at least a 3 in one remake for the 3DS or something because it’s a shame that those games are not even coming out on the virtual console! I mean… seriously why the hell they takin so long to come out on the virtual console. I want no sequel no remake no nothing. Its fine as is. Who makes all those comments that consist of a link? Probably Itoi will not be the person behind, but i don’t think if the Mother saga will end in this way. Pixar? He’s underestimating his own game.. Mother 4 would suk enwayz, I will maek a game better that the mother4. jUst wait and see. Powerful stuff. I was reminded of the end of Mother 3 while I was reading through all the comments. There is no joy without sorrow, no beginning without an end, and no Mother series without us. Which also reminded me of how Paula had to pray for the strength of everyone to defeat Giygas, which itself is a manifestation of pain and terror. So I’m the one who finished the Mother games, one by one. So I’m the one who took his work and ran with it, from the highest mountains to the farthest lakes. I am now living Mother 4. You know, I DO remember now Itoi asking in the beginning of Earthbound if this was ok.
Itoi said there that if there ever was a Mother 4, he would want to be the player, not involved in the production of it. Does he know about the Mother 4 project? OMG im pretty sure there is going to be a mother 4 because in Nintendo Power magazine vol 275 january february issue there was an interview with the creator of the new kid icarus game masahiro sakurai (he is known for giving revivals to games)and he was asked if he wanted to give a revival to a long dormant game or character what would it be, to which he replied that he might have something in mind to be released before the new smash bros and since itoi said he wanted to be the player of the game, not the creator maybe masahiro sakurai is taking over the series!!!!!!!!!!!!!!!! 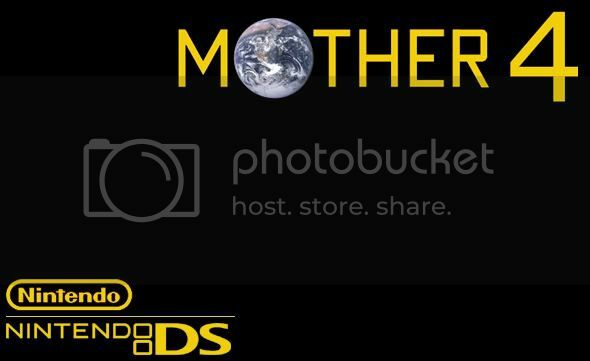 I highly doubt that to be honest…Not to mention, the Mother/Earthbound series aren’t considered dormant. I mean three games, and the most recent one was Mother 3. It’s pretty fresh, I mean it’s a cultural icon in Japan with all of the Mr. Saturns that are present in the country. and it really makes you think. After reading this, im not sure I want a Mother 4, because if Mr. Itoi is happy with it, thats what matters to me. Even if the guy on kid icaurus wants to make mother 4, it’s not a true mother game without itoi. I guess that Itoi lost faith in the Mother series after the failure of EarthBound 64, which probably had enough graphics alone to go over the 64 MB N64 cart limit. If that was the case, then why did he let Mother 3 come out on the GBA? He also almost regularly leaves posts on both twitter and his personal site thanking the fans for their dedication, and what a good experience it was. We don’t need a MOTHER 4. If you want to experience new things in the world of MOTHER, just restart the game and try new approaches. It’s The Best With No Comparison!!! I can’t wait until the Mother 4 fan game is released! I never played the mother sires but i have seen full lps of them and am a big fan i can’t wait for mother4. One other thing could anyone give me a like for the gameboy version of the games thanks. It sounded like Iwata was a therapist and Itoi was his patient. Oh and dana miller the gameboy versions are all in japanese. 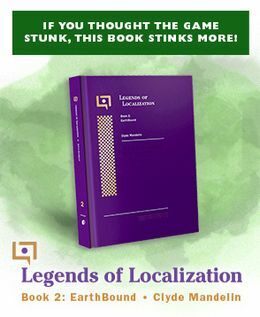 But since Mato translated them you can just go to mother3.fobby.net for the mother 3 patch and the Mother 1+2 section of this website to get the Mother 1+2 patch. Oh and also if they were gonna make a Mother 4 it would have to teach us something. Mother taught us how much power a song can hold. Mother 2 taught us the power of friendship. Mother 3 most importantly taught us the power of love. What would Mother 4 teach you? It was very inspiring of Itoi to give such a great game for the NES,SNES,& GBA even if Earthbound was a fail due to its story line,but was popular for even people on Youtube that have a channel. The Mother series will always teach us a lesson,everyone. Though we love Mother very much, I think that after the mastermind retires or passes away, one may try to obtain the legal rights and make a Mother 4. Will it be beautiful and consistent to Mother’s themes? I’d love to help write and make a fourth and maybe even fifth installment to a story that was ages far ahead of its time. Uhm…. I’m pretty sure that Nintendo fully owns any and all rights to the Mother series forever and in perpetuity. In fact, I’m not even sure that Itoi himself is able to reserve any rights for himself of any of the characters, situations or trademarks of any of the games that he created entirely within the scope of Nintendo’s contract and work agreement. Itoi was employed by Nintendo to write the games, not the other way around. P.S And if one thinks they stand any chance of buying a trademark away from a company like Nintendo….. I don’t even think Nintendo would ever even let an intellectual property that they have no plans to ever do anything with like “Joy Mech Fight” go. Because the rule of thumb with companies is that they not only won’t let go of any property they own, they sure as heck won’t let anyone profit or complete with Nintendo even on the smallest level. Even if Nintendo owns the copyright on even the most minor work, that will likely never be revived, like Joy Mech Fight or Star Tropics, they won’t ever let anyone else make money off of something even if they have no plans to. That’s all well and good, but you do realise that Nintendo regularly licenses its IP out to other companies, yes? All of the portable Zelda games, to my knowledge, were made by Capcom. The upcoming Smash Bros. game is by Sora Ltd. and Namco. Metroid: Other M was by Team Ninja. Will Nintendo just straight-up sell off a piece of valuable IP? I dunno. If the offer were good enough, maybe. But if a third party approaches them with an offer to *license* the IP, Nintendo tends to be fairly open to that, historically. Dude! Making MOTHER films with Pixar?! That would be a dream come true! And the MOTHER series would fit perfect with all the other pixar films! PIXAR PLEASE MAKE A MOVIE FOR MOTHER! PLEASE! Like Shigesato Itoi said, POTENTIAL!!! THERE IS HUGE POTENTIAL FOR THIS GAME TO BE A MOVIE SERIES RIGHT NOW! IT WILL BE THE GREATEST MOVIES YOU WILL EVER MAKE! It’s clear that Itoi is done with MOTHER, but if he ever makes another game, what I’d really want him to come back to is not a MOTHER 4, but a completely new kind of game. The saga of MOTHER has reached an end with the second end screen in 3 (the one without a ? ), and it’s clear that another official game in the series is out of the question, but if he were to create a new, totally different IP, I know I’d play it.